The movie Divergent has been filming in Chicago for months and is now filming scenes in Los Angeles. Divergent is a sci fi thriller based on the Veronica Roth novels and is often compared to “The Hunger Games” trilogy. Divergent is a trilogy, The first novel is Divergent followed by Insurgent and the final book Allegiant. The film stars Shailene Woodley as Beateice, Theo James as Four and Kate Winslet as Jeanine. 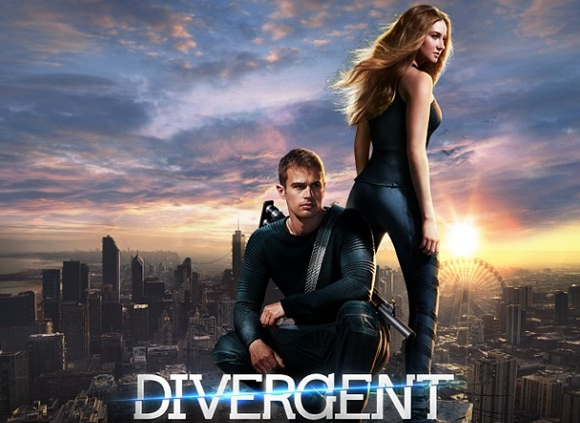 Divergent, the movie will be released on March 21, 2014. The working title for the casting call is “Catbird”. The film project currently called “Catbird” (Working Title) is filming in Los Angeles and casting directors at Sande Alessi are seeking tall, thin women and tall, thin men to be extras on set in January. Must be available for fitting on Monday. Beatrice Prior, or Tris Prior, a teenager with special powers is told she is Divergent and will never fit into any one group. Tris discovers a conspiracy to destroy all Divergents. Beatrice finds that she is in danger when a leader seeks to exterminate her kind in her effort to seize control of their divided society. The society has factions and Beatrice is initiated into Dauntless. Los Angeles residents only. No travel expenses will be paid. NON UNION CASTING NOTICE-Shoots in Los Angeles on “Catbird”. MUST LIVE IN LOS ANGELES TO SUBMIT. You cannot have ever been fit or worked on “Catbird” before. Fitting on Monday, January 6th. Works some or all of January 21st thru 26th. Do you have a friend or family member who is extremely opinionated and outspoken? When it comes to their morals, do they “practice what they preach” or are they hypocritical? Would they do the right thing when faced with an ethical dilemma? Now is your chance to see how they would really react in a new hidden camera show! Are you ready to put YOUR unsuspecting friends and family members to the test and see their true colors?? Compensation will be provided. Potential candidates must be willing to go to a gym. Email: Melissa.casting@gmail.com with your name, age, current photo, phone number & a brief summary about the person you want to set up. Be specific about why they would make a great candidate for our show (pet peeves, strong beliefs, etc..) Please include their name, age, and current photo as well. Must be available January 10, 11, or 12. Please note which day would work best. Los Angeles Real World fans have a chance to get cast to be in the audience, to see new episodes before they are out to the world and maybe even hang for the day with the MTV Real World Cast. 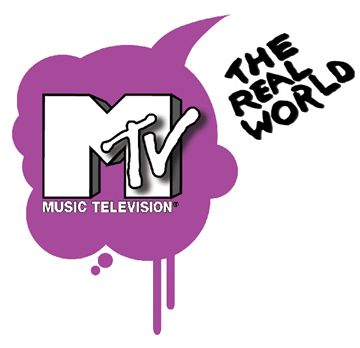 MTV is looking for Real World fans in L.A., Sorry out-of-towners, they are only looking for Los Angeles residents who have all day availability on January 9th in Glendale. The show will film at Glendale Studios and the call time is 9AM. The show is allowing up to 4 tickets for this show per request and I am sure they are on a first come first served basis so if you are interested, you better apply for the MTV tickets ASAP. Are you a die-hard Real World fan? Do you want to be the FIRST to screen new episodes, see the cast of the newest Real World: Ex-Plosion, and hang with the cast and MTV for the day? Here’s your chance!!! Must be in Los Angeles. Must be free for the day on January 9th. Must be 18 & up (or attend w adult/guardian if under 18). Busch Gardens Williamsberg will be holding open auditions for triple threats…. Singers/Dancers/Actors for the new lineup of shows for their 2014 season. Auditions will be held in New York City, Atlanta, Williamsberg and Chicago. Rehearsals for the show will begin in February in Williamsberg. The park has a new lineup of shows that will include a Vegas style musical. Showtime is celebration time at Busch Gardens® theme park. Casting directors are now seeking performers for the incredible performances they put together on outdoor stages and in theaters throughout the park. Busch Gardens Williamsburg is a 383-acre theme park located in James City County, Virginia, about 3 miles southeast of Williamsburg, originally developed by Anheuser-Busch and currently owned by SeaWorld. Monday, Jan. 13th – 10:00 am: Female Singers interested in roles listed below. Monday, Jan. 13th – 1:00 pm: Male Singers interested in roles listed below. Tuesday, Jan. 14th – 10:00 am: Female Dancers interested in roles listed below. Tuesday, Jan. 14th – 1:00 pm: Male Dancers interested in roles listed below. Wednesday, Jan. 15th – 10:00 am: Interactive Performers interested in roles listed below. Wednesday, Jan. 15th – 1:00 pm: Color Guard interested in roles listed below. Sunday, Jan. 19th – 10:00 am: Singers interested in roles listed below. Sunday, Jan. 19th – 1:00 pm: Dancers interested in roles listed below. Sunday, Jan. 19th – 5 pm: Color Guard and musicians interested in roles below. Tuesday,Febraury 4th – 10:00 am: Female Dancers interested in roles listed below. Tuesday,Febraury 4th – 1:00 am: Male Dancers interested in roles listed below. Wednesday February 5th – 10 am: Color Guard interested in roles listed below. Please prepare a song selection that shows off your voice and range. Contemporary Broadway or pop is best for us.. Singers should be prepared to come back for a movement call later in the day. Bring sheet music. No CD accompaniment please. Pianist provided. Dancers should bring both characters and flats, and tap shoes if you tap. For the dance call Dancers should still bring a song selection Please bring your audition book, in case you are asked to sing another type of song selection. Bring picture & resume.. Non-Equity performers only. Tampa Florida – Busch Gardens Tampa Theme Park will be holding open auditions for their 2014 live shows and other performance jobs at the park. Busch Gardens is Part of the Sea World family of parks. Busch Gardens offers a variety of shows including seasonal shows such as Howl-O-Scream, Summer Nights and their Holiday Show, Christmas Town. Busch Gardens Tampa will be holding open auditions on Sunday February 9th for a variety of shows in our 2014 season. Please see below for more detailed casting information. Some callbacks will be held later that day, so please make arrangements to be available. Audition date is 2/9/2014 and the audition times for singers, dancers and musicians are listed below – Please note that you need to fill out an online application here first. Arrive at 3:00 pm on the day of your audition. Be prepared to learn a combination and demonstrate any special skills. Be ready to learn a challenging dance combination. Please have your hair pulled back away from your face-we want to see your eyes and great smile. Please prepare a 1 minute pop/rock selection that highlights your range. Arrive at 12:00 on the day of your audition. Your best 16 bars or 1 minute of both an uptempo and ballad selection. Please start with your strongest song, as we may not be able to see both. A cappella singing will not be permitted. Singers who act, prepare a 1-minute comedic monologue of your choice. Please arrive at the actor time slot to read your monologue. Have a current head shot and resume. We may ask you to learn a simple dance combination, sing a selection from one of our shows and/or read a simple speech. Looking for musicians with performing experience to play drum kit, guitar, bass & keyboard. Also looking for guitar players with Flamenco experience- singing experience a plus. Arrive at 12:30 on the day of your audition. Be prepared to learn a simple movement combination as well as participate in improv exercises. Please prepare a 1 minute comedic monologue and be prepared to demonstrate any special skills. If your act requires fire or extensive set up, please bring a video instead. You may also e-mail any YouTube clips or promotional info to bgtaudtns@buschgardens.com . Please put “Specialty Actor” in the subject line. Arrive at 11:00 am on the day of your audition. We are located on the south side of E. Bougainvillea Ave. Once you pull in to driveway, please park on your right in the Human Resources parking lot. Please wait outside the security station until the guard has advised you that you may proceed to the entertainment building. Busch Gardens pays an hourly rate to performers with perks and benefits available to full-time employees such as paid vacation. You can see more details on their website. 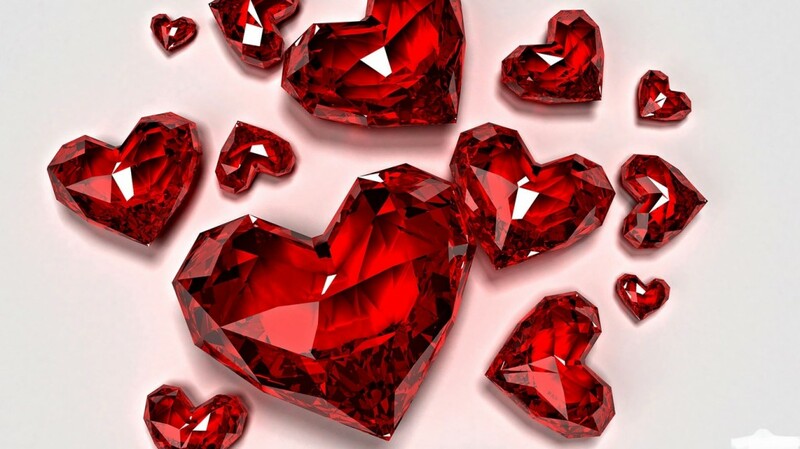 Reality Series: Young Women Preparing to Divorce! A new documentary television series will feature women who got married young, and are now facing a DIVORCE. Screaming Flea Productions, in conjunction with a major cable network, are seeking women under the age of 25 who are preparing to file for divorce but have not yet pulled the plug! The series will feature the unique experiences of young women going through the divorce process, while respecting the magnitude of their situation. If you are under 25, married, and preparing to tell your husband you want a divorce, we want to hear from you! Please email Divorced@sfpseattle.com with your name, age, contact information, and a brief summary of your situation. There will be $ compensation for the women chosen to appear on the show. Los Angeles Casting directors, Sande Alessi Casting, are seeking quite a few dancers, body builder and a parkour expert for a January video shoot. The video will film in Los Angeles and auditions will also be held in Los Angeles. The roles are all paid and the skills requited are described below. Union and non-union are OK to apply. Please only apply if you fit the descriptions exactly and are available to audition in Los Angeles around the beginning of the second week of January. The video will film later in January. No travel expenses will be covered, so L.A. residents only. Sande Allessi is a Los Angeles based casting director whose credits include Fight Club, Pirates of the Caribbean, The Lone Ranger, The Girl with the Dragon Tattoo, War of the Worlds, Entourage, Grownups 2 and countless other production. Please read carefully because this is quite long (Sande Alessi Casting Notice). CASTING NOTICE-SAG OR NON UNION (NO UNION JURISDICTION) for Professional Dancers. Shoots in Los Angeles on January 30 & 31. Auditions are January 8th and 9th. Rate is $500/8 + agency. Wipeout Season 7 Casting Singles for Blind Date Episode! Hey Everyone! The time has come… Wipeout Season 7 is casting for Singles for an upcoming 2014 episode of the show! Come compete on Wipe out for a blind date and have fun doing it! If you know someone with an amazing personality that needs a date, send the casting team an email! The show is looking for all kinds of contestants for different episodes. Today, they announced they would be casting a blind date episode and are looking for singles to participate! Wipeout, the hit ABC over sized obstacle course competition show is coming back in 2014 and open casting calls for wipeout will begin in January of 2014. The show is taking submissions through email as well as having an open casting call. Do you think you can take on the Huge Red Balls and every other giant sized… and wet obstacle that this very fun physical game show has to offer? Tryout for Wipe Out Season 7 Coming in 2014! Wipeout is a ABC game show / reality competition in which courageous participants compete in what is the show calls the “world’s largest obstacle course“. Wipeout is hosted by John Henson and John Anderson. Jill Wagner is also on the show as the presenter. 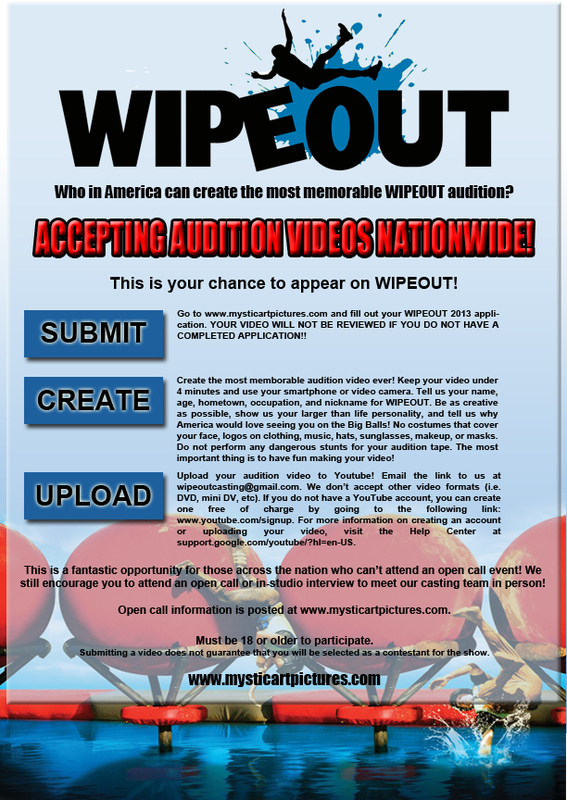 Reality TV powerhouse Mystic Arts and Endemol USA are now casting Wipeout 2014! Wanna compete on Wipeout or know a single who does? send an email to wipeoutcasting@gmail.com with a link to a video. Before creating and sending your video audition, see the below flyer for instructions on what to do with the video. You can also check out other reality show try outs! Tired of jumping through hoops and the many risks that come with a night out? It’s all about who you know! Enjoy all of the Perks of Partying by being part of the most connected Social Club! Casting Industry Standard models who are socially engaging, open minded and able to attend various events in Atlanta, GA area to participate in pilot program for an Elite Social Club. Feedback and surveys are mandatory. To be determined–in Atlanta, GA.
Seeking Talent: Select a role below for more information and submission instructions. Models looking to explore the Atlanta Nightlife while enjoying the many perks of being part of an elite social club. Seeking submissions from: Atlanta, GA; send Comp Card and contact information to above email to apply. “VIRTUOUS” CASTING VARIOUS ROLES and many featured roles. JC Films is currently in production on its third Christian / faith based production titled “Virtuous”. The film will be shooting in Georgia and is seeking local talent for the roles listed below. These are unpaid roles so locals only please. JC Films exists to engage our culture through superbly produced faith-based feature films. You can learn more about JC Films Here. You can also learn more about their previous production by watching the trailer below of their previous work. Eric Estrada, best known for his work on the TV series “Chips” is the companies spokesperson and also stars it the films. “Virtuous will be the third feature film by JC Films and directed by Bill Rahn. VIRTUOUS a multi-plot film focusing on unwavering characteristics that will make women live more virtuous, empowered and inspired! What does a virtuous woman look like in today’s culture? Can a woman be both righteous in her convictions and lifestyle while being “rowdy” enough to stand-up and defend those convictions? VIRTUOUS is a modern day version of Proverbs 31. It’s the story of a Hollywood starlet, a soldier on the battlefield, the successful businesswoman, and the housekeeping and cooking skills of dear old Mom. All scenes are shot between Griffin, GA and Macon, GA.
About JC Films: We produce family-friendly narrative films to assist Christ-centered, culturally-changing and well-established organizations spread their message through feature films. Basically, we write, cast, and produce amazing films for astonishing ministries to help get their message out! Please note that these are NON-PAID roles but they are featured roles. IRAQI SOLDIERS: If you appear Arabic, we want to cast you as an Iraqi soldier in a rescue mission. Scruffy faces, darker skinned. Films January 8. GYM RATS: Guys especially, 20-50. In good shape gym goers. Films January 3rd. All looks 20-70 male and female. NEW YEAR’S EVE PARTY GOERS. Families with 8-10 year old kids. Can be the same from NY Eve party or new faces. Please email name, age, photo of yourself or in case of family submissions, the family photo. In the subject line please put role you are submitting for. ie: IRAQI SOLDIER or JUROR. Email: virtuouscasting@gmail.com with your information and follow the above instructions. New PILOT Casting NOW – Secretly in LOVE with someone you aren’t dating? We are rooting for the underdog, not making fun or causing drama! There is VERY generous compensation for the one day shoot. Brief story of your situation, contact info, and at least one current pic. Executive Producer, Series Writer, and Creator, Edgar Alexander is seeking for a unsigned undiscovered actor to appear in a nationally syndicated television series. The Plot- Includes an African-American Family. A loving Father and his Wife, raises their children, in a local community. Starring Edgar Alexander and Kimberly Roulin. The Football Hero- Cocky, arrogant, has a huge ego, and must have swagger. African-American Male. Ages: 18-22 only. Salary Paid: $200.00. Including credit, copy, meals, and breaks. If you’re planning to visit and audition in the Los Angeles, California area, you must provide your own traveling arrangements to audition. If selected by the producer, will pay for the traveling arrangements to be in our show. All auditions will be held in the Los Angeles, California area. Audition date: 3/15/2014. No on-line auditions won’t be accepted. E-mail your submissions at: ea7485@gmail.com Non-Union only. Entertainment unions not eligible to audition for this event. For additional roles, please type in New TV Sitcom. At: auditonsfree.com This project, is not affiliated with any talent agencies, management groups, promoters or any other source. The AMC television series “TURN” is filming in the Central Virginia area and will be holding an open casting call for paid extras / background actors in Virginia for both Union (SAG-Aftra) and non-union talent. The series is set during the time of the Revolutionary war and production is looking for extras that can fit into that time period. That means no fake hair, body modification, tattoos, braces, etc. All extras need to look natural. They are looking for people who have longish hair to fit into that time period. You can watch the trailer below to see what the show is about and the looks they are seeking. They are seeking adults and children of all ethnicities with a natural look. You can see the detailed info below for more on what production is looking for. AMC has churned out some amazing original series lately with Braking Bad and The Walking Dead, I am sure the folks at AMC are hoping Turn will follow their recent trend of award winning dramas. The series is filming now and will be released in 2014. The period drama centers on a py ring during the Revolutionary war. 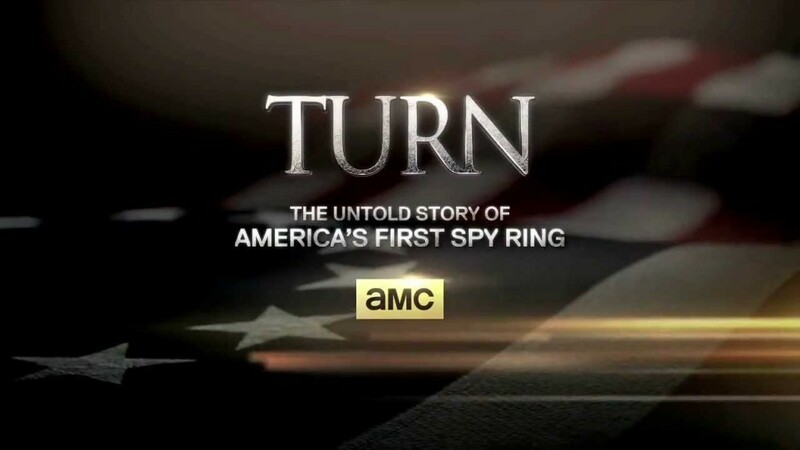 TURN is set in the summer of 1778, show tells the story of New York farmer, Abe Woodhull, who bands together with a group of childhood friends to form The Culper Ring, an unlikely group of spies who turn the tide in America’s fight for independence. We are seeking paid background who look authentically from the Revolutionary War period. An OPEN CALL is being held on Sunday afternoon, January 5, 2014 in Richmond, VA.
SAG-AFTRA members as well as non-union members are encouraged to attend. Seeking background characters who can look authentically as if they are from the Revolutionary War period for extra roles, including group military scenes, farm field workers, and tavern and village scenes. The Revolutionary War happened over 230 years ago, and we need background characters who look like they are from that time period. Therefore no visible tattoos and no braces. Hair should look natural, NOT processed or colored. Eyebrows should be natural, NOT modern and plucked. Teeth should look natural and real, NOT noticeably capped or modern. Long hair in both sexes is highly desirable. Ability to see/function without physically wearing eyeglasses is needed (contacts are okay). MEN (especially with long hair) who look proper to the Revolutionary War period. Beards were not popular during the Revolutionary War, and so nearly all of our male roles require men to be clean shaven. Hair long enough to be pulled back into a ponytail (even if there is no actual ponytail beyond that) is very highly desirable. Please let us know if you have experience with Revolutionary War era marching and military drills, or any other unique skills and background relevant to the time period. All ethnicities are needed…especially African American and Caucasian. WOMEN with long, natural looking hair, including those who can knit, use a spinning wheel and/or have other unique skills and background relevant to the time period. All ethnicities are needed…especially African American and Caucasian. CHILDREN who look proper to the Revolutionary War period (slender, long hair needed for both sexes), are comfortable outdoors, are good at following directions and comfortable in new situations. All ethnicities are needed…especially African American and Caucasian. MEN and WOMEN and CHILDREN with characteristics which reflect any physical challenges and/or unique features, including but not limited to: noticeable facial scars, blind or missing eyes, imperfectly healed broken noses, missing teeth, missing limbs or digits or any kind of amputation. All ethnicities are needed…especially African American and Caucasian. AFRICAN AMERICAN MEN, WOMEN AND CHILDREN able to realistically portray house slaves/field workers during the Revolutionary War period. It is most preferable that you attend the open call (no appointment needed, hence the name OPEN call) to be considered for background work on the series. We are old school…we want to talk to you in person! 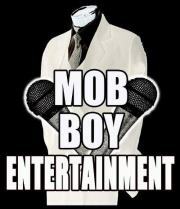 Looking to do the shoot in early to mid January in Las Vegas, NV. Please take note this is not a commissioned shoot thus no one is being paid for it including ourseles. Please send a photo of yourself, your Motorcycle,YOU MUST HAVE A MOTORCYCLE!!! (NO NUDES PLEASE!!! !, this is not that type of shoot), and contact information, phone and email. A staff member will contact everyone who replies to let them know of our decision. We would like to have this shoot done no later than the 24th of January. It will be done in several locations in the Las Vegas Nevada area. The Photographer that will be taking the photos is our Creative Director/Lead Photographer, who has numerous magazine covers and features worldwide. This is a NON-Commissioned photo shoot, that is strictly a TFP/TFCD, that may be used for your portfolio etc. You may NOT sell these photos or be compensated in anyway with the used of the copyrighted photos.